To all the 'hardy souls' who turned up at Tesco this morning to participate in our Easter Egg Run. Sadly the Run had to be cancelled on safety grounds due to the snowfalls that we had during the night. The car parks (and roads) were checked early on the morning and it was felt at that time to be too dangerous to proceed with the run. 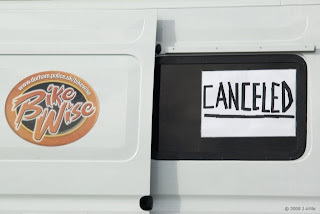 We put the cancellation notice out on the website & local radio about 0800hrs. Thanks for all the Easter Eggs & cash donations that were made. The Eggs have already gone out to the hospitals and the money will be donated to our nominated charity..
Due to the weather conditions and the state of the surface conditions in the car parks we regret that we have had to cancel the Easter Egg Run. If you wish to drop your Easter eggs off at Tesco's we will be there to distribute them at a later date or alternatively drop them at police headquarters on Tuesday. The photo's from our 3rd indoor meeting of 2008 at Black & Deckers, Spennymoor. Some really smooth riding and a really nice atmosphere. Sorry it's taken a few days to send this email but it's been a bit hectic at home with my granddaughter staying.. The parents / grandparents & friends who turn up and support. You all make the event have such a nice friendly atmosphere..
John Attle for taking the photo's throughout the day..
A Big Thank You to Denise, Denica & Phil Lockey & Anne Barber for putting on the Easter Egg Raffle (They bought all the presents and donated all the proceeds to the club) - a total of £100.70 was raised. Next BikeWise meeting is going to be held on Sunday 30th March - 1000hrs, at Black and Deckers.. I know some of the riders would love to be outdoors again, but with the weather being so unsettled we are better running indoors at the moment to guarantee the event, rather than going outdoors and having to cancel because of bad weather. PPIK is on the same day - (although it doesn't start till about 6pm) - apologies if this causes a problem to some. 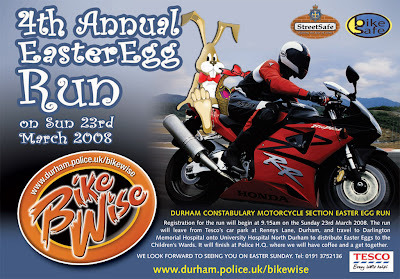 Our 4th Annual Easter Egg Run will be taking place on Easter Sunday 23rd March. Registration for the run will begin at 9.15am at Tesco's car park, Rennys Lane, Durham. 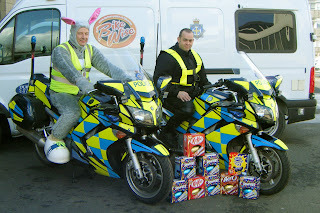 The run will leave Tesco's at 10.00am and will travel to Darlington Memorial Hospital and onto University Hospital North Durham to and distribute Easter Eggs to the children's wards. The run will finish at Police HQ, Durham where we will have a cuppa and get together to talk about the biking season ahead. Again we ask that you bring along an Easter Egg or some change to put into one of our charity buckets. We look forward to seeing you all on Easter Sunday. The motorcycle section has this week taken delivery of a new fleet of patrol bikes. The bikes are Yamaha FJR1300s, deep blue in colour and replace the former fleet of Honda Pan European ST 1300's. The new bikes are a departure for Durham Constabulary in that they are the first vehicles in the whole fleet to adopt the national Battenberg style of police livery. In addition they are the first Durham police bikes to be fitted with Incident Data Recorders which act rather like a black box in that should a collision occur they will instantly record data to help investigators establish the cause. Local MP Roberta Blackman-Woods attended the BikeWise Mini-Bike Club and echoed her support of the venture which has recently been shortlisted for a regional ShiNE award. Local MP, Roberta Blackman-Woods attended the BikeWise Mini-Bike Club and echoed her support of the venture which has recently been shortlisted for a regional ShiNE award.